Oman Air, the national carrier of the Sultanate of Oman, has appointed Paul Starrs as its Chief Commercial Officer effective from April 1st 2018. Bringing with him many years of professional experience in the aviation industry, Paul will mainly focus on developing a comprehensive and sustainable plan to improve Oman Air’s commercial operations. On behalf of Oman Air management team, Acting Chief Executive Officer, Abdulaziz Al Raisi, announced the appointment saying, “We are delighted to welcome Paul back to Oman Air to help further strengthen the company’s commercial operations as we continue our exciting expansion plans. Revenue Management, Network and Scheduling, Sales, Marketing, e-commerce, Oman Air holidays, Guest Experience, Call Centers and commercial cargo sales will report to him. Prior to his appointment, Paul Starrs was the Senior Vice President Global Sales, Distribution and Ancillary products for Emirates. Paul Starrs’ previous roles include Regional Manager Commercial Operations with Emirates and General Manager Worldwide Sales for Oman Air. 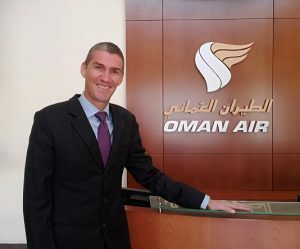 Paul started his aviation and airline stint with British Airways moving his way up there before joining Oman Air as Regional Manager – Commercial Operations in 2009.